Delfino Sisto Legnani and Marco Cappelletti. 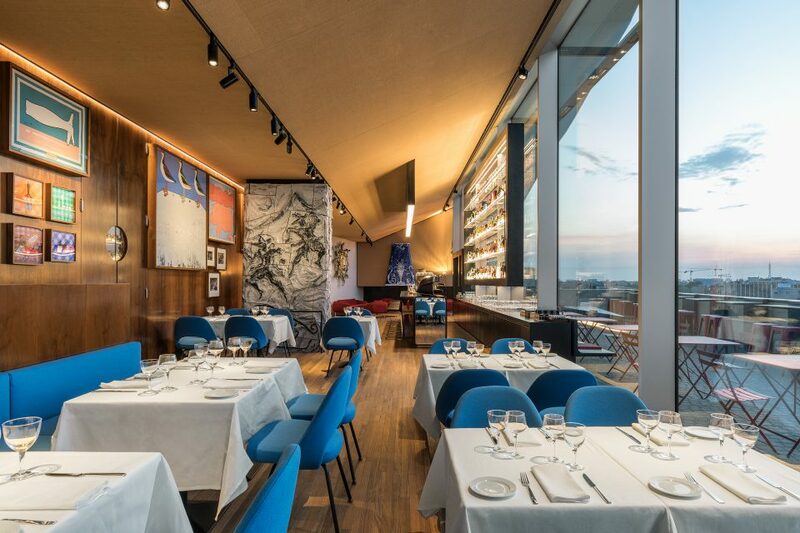 Restaurant Torre is located on the sixth and seventh floors of the new tower at Fondazione Prada’s Milan venue, designed by Rem Koolhaas with Chris van Duijn and Federico Pompignoli from architecture firm OMA. It appears, according to Koolhaas’s definition, as “a collage of pre-existing themes and elements”, combining works of art and design furniture. Its main room is located on the sixth floor and occupies an area of 215 m² divided into two parts: the bar and the restaurant. 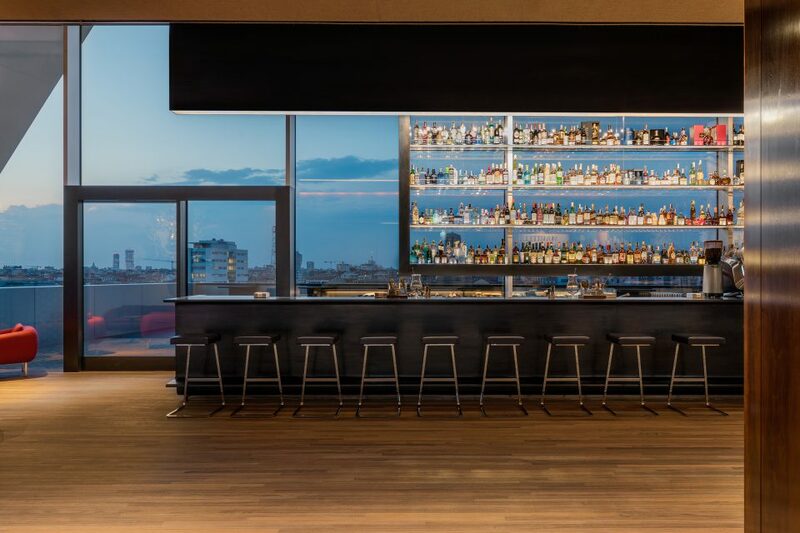 The two spaces are characterized by a contrast between the large floor-to-ceiling windows, which offer an unprecedented view of the city of Milan, and the warm tones of the parquet, of the walnut carpentry work and the hemp panels that cover the walls. The bar has a central counter, with a suspended bottle rack containing spirits and international liqueurs, where it is possible to enjoy a cocktail and a light dinner. On the left is a fireplace surrounded by Soviet armchairs and Eero Saarinen’s Tulip tables. 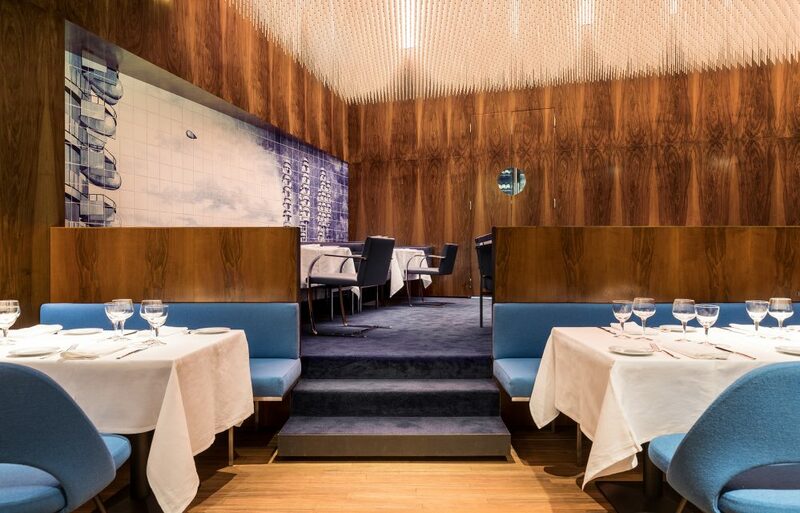 This space hosts two works of art—Cappa per caminetto (1949) and Testa di medusa (1948-54)—by Lucio Fontana, while the polychrome ceramic Pilastro (1947) by the same artist introduces guests to the restaurant itself. The restaurant has seating for 84 guests and is arranged on three levels slightly offset from each other to recreate an ideal viewpoint. 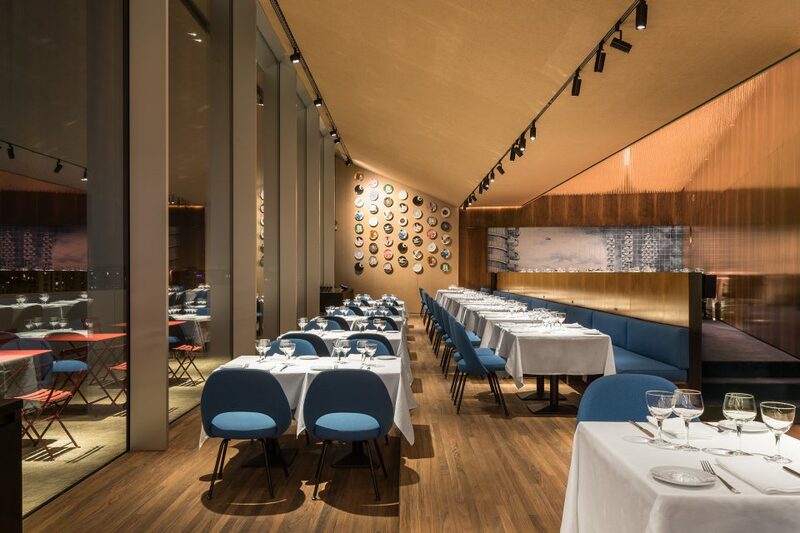 The first two are furnished with wooden tables and Executive chairs by Eero Saarinen and feature a selection of paintings by William N. Copley, Jeff Koons, Goshka Macuga and John Wesley. The third level features original furnishings from New York’s “Four Seasons Restaurant” designed by Philip Johnson in 1958 and elements from Carsten Höller’s installation The Double Club (2008-2009). Inspired by the tradition of Italian restaurants, the walls feature artist’s plates created especially for the restaurant by John Baldessari, Thomas Demand, Nathalie Djurberg & Hans Berg, Elmgreen & Dragset, Joep Van Lieshout, Goshka Macuga, Mariko Mori, Tobias Rehberger, Andreas Slominski, Francesco Vezzoli and John Wesley; forming a series open to new contributions. 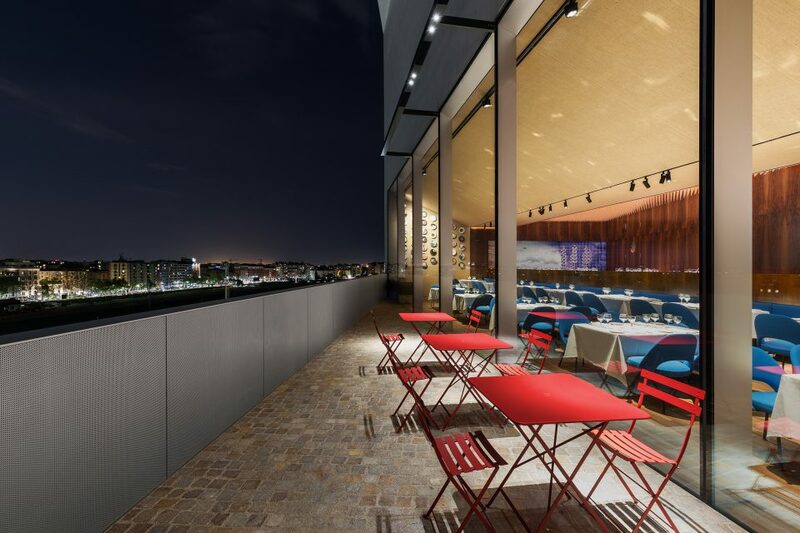 The triangular outdoor terrace overlooks the urban space and features the typical porphyry paving and metal grills characteristic of Fondazione Prada’s exteriors. The 125 m² area is divided into a restaurant area seating 20 on bistro-style folding tables and chairs and a bar area where sliding tables along the parapet can be combined or separated according to need. On the seventh floor is the chef’s table, an exclusive and reserved space with dedicated services, characterized by a glass wall with a view of the kitchens and a private terrace. Torre’s menu is authentically Italian and draws on the best regional traditions, while the desserts offer a range of the great classics of Italian patisserie. A prestigious selection of wines from Italian and international labels completes the offer.